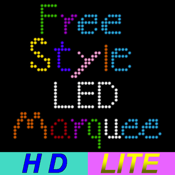 * It is a Marquee App which user can draw via LED freely. * You could set LED's color, canvas length, move direction, move speed, gap width, blink frequency and background color of your own. * Full Version provide the save function for further useage and editing. * The more explanations please refer to the Readme of the app or APP Support. * This version does not provide the save function.